Happy Monday everyone! It’s time now for another Technostamper Monday Lunchtime Sketch Challenge! This is a fun sketch this week and since I’m really lovin’ Mint Macaron, I thought I’d pair it up with Watermelon Melon for a fun birthday card! 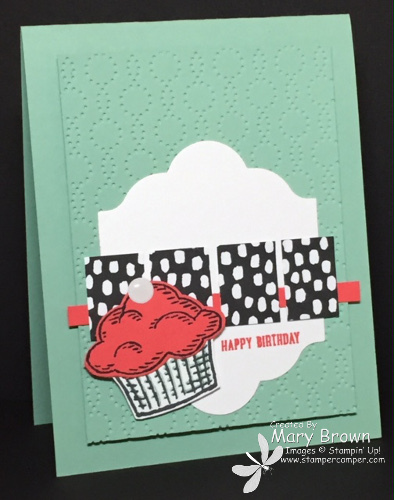 This is the first I’ve played with the Everyday Chic dsp and loved how this print went with the rest of the card. To do the background white piece, I used the largest Lots of Labels framelit but made it shorter than the framelit by running it through twice to make it shorter. Whisper White – cut out using the Lots of Labels Framelits, run through twice to make it shorter. Add to card front. Watermelon Wonder – 1/4 x 3 3/4 add to card front. Everyday Chic – cut out four rectangles 1 x 3/4 and add to card front. Stamp greeting using Watermelon Wonder. Stamp cupcake base using Memento Black on Whisper White, cut out, stamp cupcake top using Memento Black on Watermelon Wonder and punch out, later and add to card front using dimensionals. Add Perfect White Accents to top of cupcake. Interesting sketch this week…I really enjoyed playing with it. I hope that that you join our challenge! Don’t forget to check out the other members of the team and remember go to the Technostamper blog to play along! 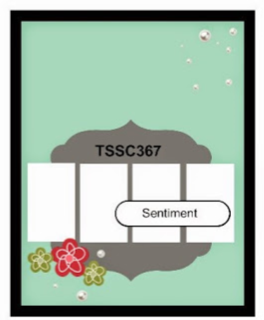 This entry was posted in Technostamper Challenge and tagged Sprinkles of Life. Bookmark the permalink.